During the Iowa Pharmacy Association’s annual Legislative Day, State Sen. Pan Jochum accepted the organization’s annual Good Governance Award for her efforts and support of public health and the pharmacy profession. More than 200 pharmacists, pharmacy technicians and student pharmacists were on hand, including (from left) Grant Houselog, Steven Lenda, Andrew Sabers, Verent Yee and Steven Strong. 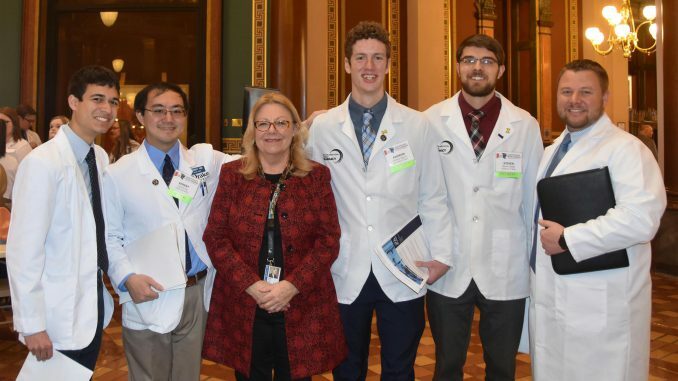 During the Iowa Pharmacy Association’s annual Legislative Day, State Sen. Pam Jochum accepted the organization’s annual Good Governance Award for her efforts and support of public health and the pharmacy profession. More than 200 pharmacists, pharmacy technicians and student pharmacists were on hand, including (from left) Grant Houselog, Steven Lenda, Andrew Sabers, Verent Yee and Steven Strong. State Sen. Pam Jochum (D-Dubuque) was presented today with the Iowa Pharmacy Association’s Good Governance Award during the organization’s annual Legislative Day in Des Moines. The Good Governance Award recognizes Sen. Jochum’s legislative efforts and support for public health and the pharmacy profession. Sen. Jochum is a state leader on health care issues. She has worked to expand affordable health insurance coverage to thousands of working Iowans, to protect the health services of Iowans with disabilities and to ensure all Iowans have access the health care they need. “Sen. Jochum understands the importance of protecting patients and has worked tirelessly to ensure healthcare providers are equipped to provide the best care possible. She has been a constant source of advice to the pharmacy profession and has positively influenced our legislative priorities over the past 25-plus years,” said Kate Gainer, executive vice president and CEO for the Iowa Pharmacy Association.